How does one measure development? In human development , one progresses from infant to child, to teen, to young adult, to adult, to senior adult. At what point does a person “come of age?” Perhaps the history of Arnold could fit into such a format. The author would like to include the that part of the Broadneck peninsula, stretching from the Severn River to the Magothy River, and as far north as Severna Park; which would include not only the zip code 2012, but also 21409. The fertile land on which Arnold and nearby communities are situated was created thousands of years ago when the Susquehanna River became the Chesapeake Bay, and the Severn and Magothy Rivers became tidal estuaries of the Bay. When Captain John Smith sailed up the Chesapeake in his exploration of the region, he reported no Indians in the area. However, he did not sail the Severn or the Magothy. There is evidence that Indians lived here; where food was easily available, the climate was moderate, and the earth was productive. The belligerent Susquehannocks replaced the more docile Algonquins, and claimed the Broadneck as their hunting grounds. Some of the roads on the Broadneck Peninsula are said to be former Indian trails. 1649-50 marked the arrival of the first white settlers on the Broadneck Peninsula. At the invitation of Cecil Calvert, 2nd Lord Baltimore, a group of Puritans, fleeing from religious persecution in Virginia, established themselves on 250 acres of land at Providence on Greenbury Point . Eight to ten families, led by Richard Bennett and William Durand came. Edward Lloyd was among that group. William Stone, a protestant, Governor of Maryland. The turmoil was reflected in Maryland by the conflict between Governor Stone and the Puritan settlers. Governor Stone required the Puritans to swear allegiance to Lord Baltimore and the proprietary government as a prerequisite to owning land. The Puritans weren’t about to swear allegiance to anyone. The fluctuations of power between Governor Stone, representing Lord Baltimore, and the Puritan leaders went from bad to worse. This dispute culminated in the Battle of the Severn, which the Puritans won. After the Battle of the Severn, the Puritans of Providence reached agreement with Lord Baltimore recognizing his proprietorship, and Lord Baltimore then restored religious tolerance between Roman Catholics and Puritans. When Anne Arundel County was created in 1650, Edward Lloyd was appointed by Governor Stone to be Commander of Anne Arundel County. Edward Lloyd and four other men were deputized to execute a treaty with the Susquehannas, supposedly arranged under the branches of a tulip popular tree that once stood on St. John’s campus. Governor Stone rewarded Mr. Lloyd with the land grant, “Swan Neck.” A stone marker was found and photographed by Mary Jane and Gilbert Moore. The marker, lost in the undergrowth somewhere off Joyce Lane, would indicate Lloyd’s land must have been near here. Childhood is the time when a young human begins to learn physical and mental skills. Still under the care of an adult, the child can try out these newly learned skills in relative safety. In like manner, the settlers learned to adopt to their new way of living in a strange land under the supervision of the Calvert family. Life calmed down for the inhabitants of Providence. They worked their plantations and worshipped as they pleased, and life was peaceful. Broadneck remained isolated and insulated from the busy world “outside.” Transportation on land was practically non-existent. The many creeks and coves provided easy access to water, and most travel as well as marketing was carried on by boat. In 1692 the Colonial Assembly enacted a law called “An Act for the Service of Almighty God and the Establishing of the Protestant Religion in the Province of Maryland”. By the terms of this Act, Anne Arundel County was divided into four parishes: Herring Creek, South River, Middle Neck, and Broad Neck. Prior to this, land divisions were called “hundreds,” according to the old English custom of designating an area of land that could support and raise one hundred soldiers for the King. Eventually the parishes were used to designate church parishes, and tax district became the accepted way to designate areas within Anne Arundel County. Broadneck became part of District 3. Whatever the land designations were, Broadneck remained an idyllic landscape of individual self-sustaining farms. The people who lived here had no desire or real need for government services. Zoning, welfare, health departments, schools were non-existent The established courts basically handled contracts, land titles, and inheritances. The American Revolution had little effect on the peninsula; no battles were fought there, and no major destruction occurred. There seemed to be almost a period of stagnation of farming because tobacco crops had worn out the land. Farms on the Broadneck were relatively small – sixty to 200 acres. The most important change after the Revolutionary War was the rise of Baltimore City as an economic center. As the city’s population grew, so did the demand for food supplies. Farmers on the Broadneck began to diversify their crops away from tobacco, as they found the soil particularly suitable for growing fruits and vegetables. Adolescence is the time when a young human begins to connect with the world, to try out new ideas, to test his limits. Land-owner names such as Arnold, Brice, Duvall, Joyce, Nichols, Pettibone, Pulley, Ridout, Spriggs, Stinchcomb, Tate, Tydings, and Winchester, appeared on the map in Hopkins’ Atlas of 1878. John Arnold, whose family had come from Virginia by way of southern Anne Arundel County, purchased land on the north shore of the Severn some time after the War of 1812. From the 1840s through the next hundred years, truck farming was the principal occupation, and Arnold became a veritable Garden of Eden filled with a variety of fruit orchards and crops. Asparagus, beans, cantaloupes, corn, peas, peaches, plums, strawberries, sweet potatoes, watermelons, and other produce carried premium prices when tagged with an Anne Arundel label. Arnold was particularly noted for its cantaloupes and watermelons. The name “truck farming” does not indicate the way crops went to market. The term truck farming indicates garden fruits and vegetables grown for the consumers’ table. During the 1800s and early 1900s, the prevalent style along the whole Eastern Seaboard of the U.S. was truck farming. There was great competition in getting your crop to market first to get the best price. One year Sophia had the first cucumbers in the Baltimore market. did hear what those cucumbers brought. In 1801 Henry Joyce bought a section of the original Swan Neck Grant, which extended roughly from what is now Rugby Hall to Pines-on-Severn. Henry Joyce was what is now called an experimental farmer. One of the first things he did on his farm called “Rayland” was to plant 300 strawberry plants and a grove of English walnut trees. His place prospered beyond expectation, and he carried his produce to Baltimore on his own sailing vessel. When the first railroad came to the southern bank of the Severn, Mr. Joyce bought more land for himself on the south bank, and divided his Rayland farm between his sons, John Henry and Cyrus. Cyrus persuaded Capt. 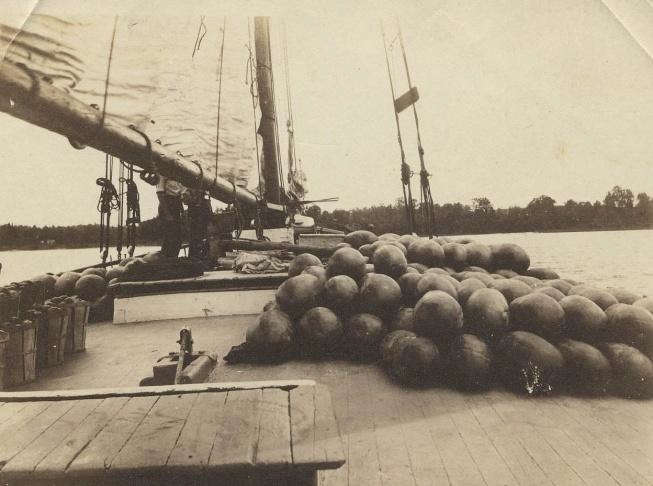 Eliason of the Tolchester Steamboat Co. to send a steamship to pick up his produce. Capt. Eliason was given a right of way through the Joyce farm and one-quarter acre of ground for a wharf. On “steamer days” farmers from all over the neighborhood brought to the Samuel J. Pentz steamboat their wagonloads of choice vegetables and fruits. Religion played a major part in the lives of Arnold residents. St. Margaret’s Parish had already been established. In 1831 a new Methodist congregation was organized and became part of the Baltimore Conference-Severn Circuit. There was only a circuit-riding preacher to serve the congregation until Thomas Arnold donated an acre of land, and the first building was erected in 1859. 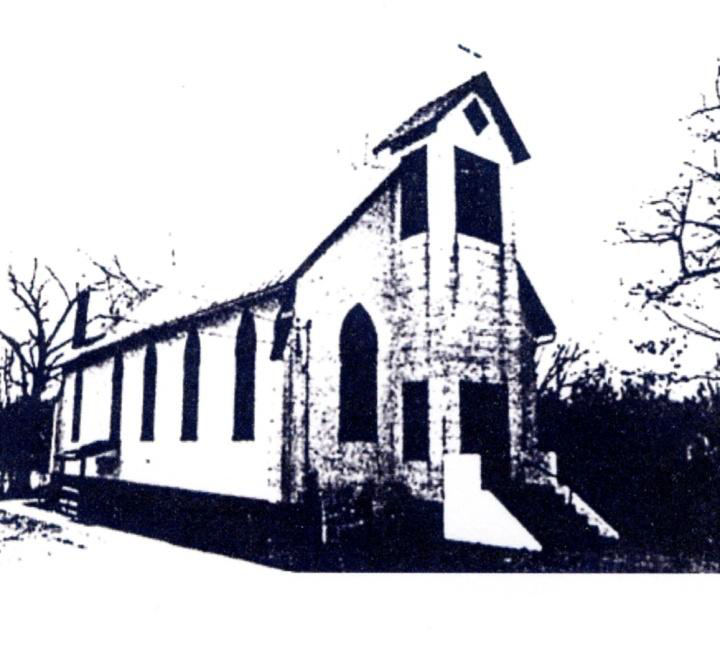 In 1851, a decade before the Civil War, a group of dedicated and self-sacrificing African-Americans purchased land from Samuel Richardson, and built Asbury Broadneck Methodist Church. The cost of building the original church was $60. Much of the social and educational life of the community revolved around these three churches. The coming of the railroad to Arnold allowed the community to become much less isolated, and to participate in social, commercial, and educational activities outside the Broadneck Peninsula. In 1902 Thomas Arnold became the station master at Arnold, and his store beside the railroad station became the Arnold Post Office. The Arnold community’s first and last industrial establishment was Tate’s cannery, located along a siding at the Arnold Station. Shortly after the turn of the century, real estate developers began to reap the rewards of selling land along the Severn River for summer homes. Pines-on-Severn was one of the earliest developments. 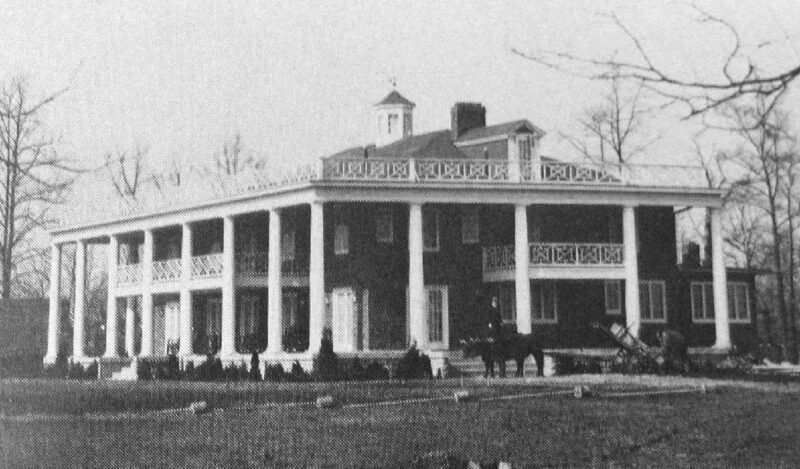 The area originally was a large farm owned by the Nichols family. In 1924 a developer named Leonidas Turner wanted to create a summer community for well-to-do people from Baltimore and Annapolis. He formed the Severn River Company and built a grand clubhouse called the Severn River Club where the Pines playground is now. The restaurant was a popular gathering place featuring tuxedo clad Afro-American waiters, with white-gloves, serving a variety of unusual foods. There was a golf course, clay tennis courts, and, of course, the beach. In 1930 a mysterious fire gutted the building. The Depression affected the Pines, as it did the rest of the country; and in 1932, the company was in foreclosure. Marlene Geiman, a long-time resident, points out that all the early houses in the Pines were built facing the water regardless of the orientation of the lot, a fact that adds to the community’s eccentric charm today. In the early 1900s Greenbury Point once again became a birthplace – this time to our country’s first Naval Air Station. Later most of the air operations were moved to Pensacola; however, some seaplanes were retained on the site. Wake Stornetta, USNA ’51, as a midshipman, flew his first seaplane, an N3N (a bi-plane known as “the yellow peril”) off the Severn River. The David Taylor Naval Ship Research and Development Center began operation in 1908, and soon became a major employer of Arnold residents. The Naval Radio Transmitter Facility with its Eiffel-like towers was conceived during World War I when Germany threatened to cut communications cables between the U.S. and Europe. The towers were used for communication with the Atlantic fleet during World War II. With the advent of satellite communications, the towers were obsolete and, except for three kept for historical purposed, were torn down. The transition to adulthood can be a period of growth and accomplishment, especially when youth have the resources they need to navigate this process. The emerging communities of Arnold were certainly not lacking in family support, connections, and opportunity. 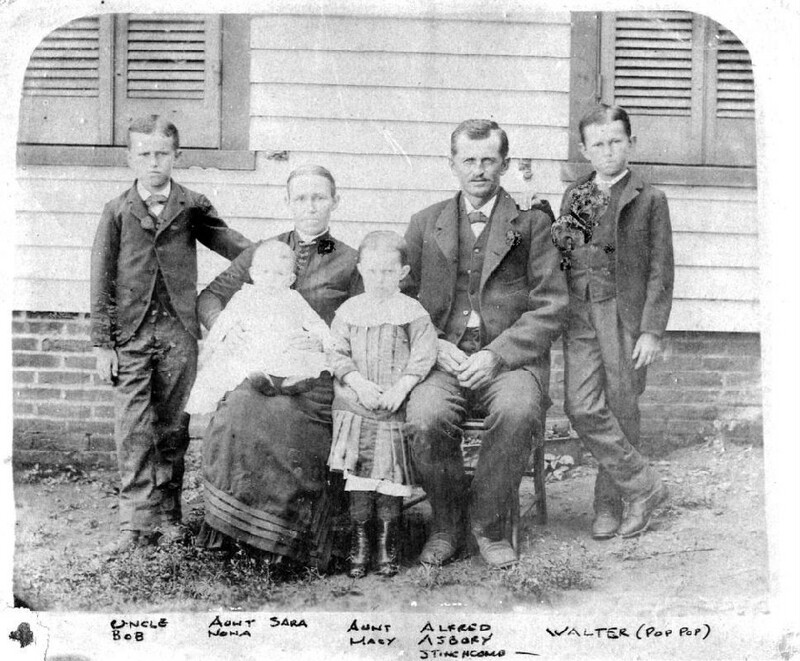 The nation began to pull out of the depression, as did the residents of Arnold. Farmers were still fairly self-supporting, and the city of Baltimore was rapidly becoming an economic center. The U.S. Naval Academy became a major source of employment for those who wished to leave farming. Another positive event was the building of Governor Ritchie Highway, a straight line between Baltimore and Annapolis. Now the Broadneck Peninsula had two ways to reach Baltimore easily. Local businesses began to develop. Among those businesses was a garage, called by various names as ownership changed, but remaining on the same spot on Baltimore and Annapolis Road. Bunker’s Well Drilling Company was another local business. Many of the houses along Church Road were the Sears and Roebuck mail order houses, which Mr. Smith, a local contractor, ordered and built. Christian Rocklitz was hired to build a new school at Arnold, plus two succeeding additions. Local country stores included Haneke’s store at the corner of Church Road and Jones Station Road, Biesecker’s on B & A Road, Fishpaw’s on B & A Road, and Arnold’s Store at the intersection of B & A Road and Old County Road. Lurty Dull had a general store at Dull’s Corner (intersection of St. Margaret’s Road and old B and A Road) . Grafton Duvall had a blacksmith shop at St. Margaret’s and Old Mill Bottom Roads and beyond that, Macey’s shop and cannery. The Labrot Race Track (now Revell Downs community) was located between Persimmon Point Road and Bayhead Road. Over on the Magothy side of Arnold watermen brought their catch to Haas Seafood. John Haas and then his son, John, Jr. could accommodate all kinds of fishing boats at their pier on Deep Creek. What is now Deep Creek Restaurant began as Baker’s; then Becker’s. then Captain Clyde’s. Captain Clyde and his wife sold it to the present owners, and now Capt. Clyde runs a fishing charter boat docked next door. Mago Vista Beach became a popular watering hole in Arnold. 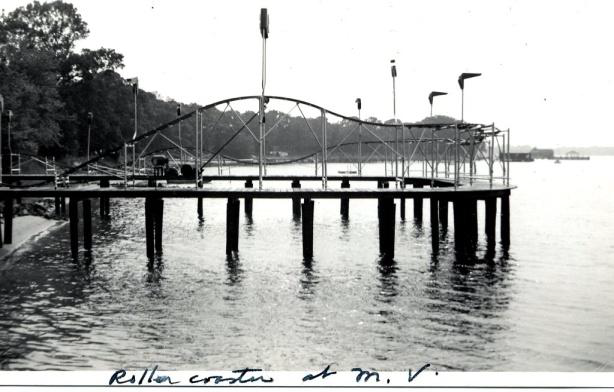 The recreational area of Mago Vista Beach was developed by owner, Robert Benson, and included a merry-go-round, small roller-coaster, an alligator pond, and a trolley ride on a track around the property. There were also two bath houses and a dance pavilion. No alcoholic beverages were allowed on the premises, and many churches held their picnics there. It is said that old Mrs. Benson patrolled the parking lot herself, to be sure no “hanky-panky” was going on. There was a luncheonette establishment which also sold gasoline at the foot of the Severn River Bridge, on a site now occupied by the Severn Inn. 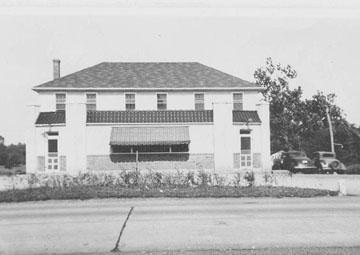 A building last known as the Arnold Pharmacy stood at the corner of Arnold Road and Ritchie Highway. This site had been known by other names such as Brookwood Dairy Store, Mayer’s, and The Canopy Restaurant. Features were a soda fountain in the back and slot machines. In 1941 the state bought a privately owned ferry service which operated from the end of King George Street in Annapolis to Matapeake on the eastern shore. The Annapolis terminal was moved to Sandy Point. This location was more convenient for the traveler, but increased congestion on the roads in Arnold when cars had to line up to wait for the next ferry. Arnold men organized the Arnold Volunteer Fire Department in 1943, and returning servicemen as well as newcomers to Arnold manned the fire equipment. There were no fire hydrants in Arnold, so the firemen filled a tank truck with water for the fire. 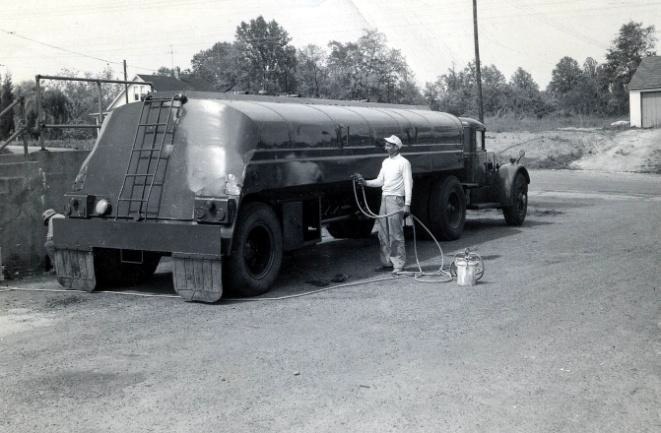 Later the truck was used to fill swimming pools. After World War II a great change took place in Arnold and Anne Arundel County. The national trend toward suburbia had begun. Encouraged by government-sponsored housing loans and much improved highway systems, people could now afford to work in the city and have a short commute to “the good life” in the country. The suburban sprawl began creeping down Ritchie Highway toward Arnold. There was land available, and no zoning laws to control development. Truck farming was on the decline; and farmers, whose land was in great demand, began selling to developers. As many as 100 building permits were being issued per day. In 1952 the first Comprehensive Zoning was adopted, and the land on four corners of the Arnold Road intersection with Ritchie Highway was zoned commercial. in any part of Arnold. building next to the Post Office. dispose of their own rubbish. In 1953, with the opening of the Chesapeake Bay Bridge and US Route 50 leading to the more rural Eastern Shore, Arnold was embraced by two major highways. One highway going east and west and one highway going north and south split the Broadneck peninsula both ways. And Arnold began to “come of age.” Planned residential developments took the place of farms. Controlling growth became a primary concern to the citizens of the Arnold area. The residents of Arnold wanted desperately to preserve their quality of life. In 1959 representatives of local community associations met to form the Broadneck Council. The old county commissioner form of government was unable to cope with the new demands of over-crowded schools, poor roads, lack of zoning, and inadequate sewage disposal and dependable water supply. Finally, in 1964, the voters of Anne Arundel County approved a new charter government replacing the county commissioners with a county executive and a county council. The 1960s ushered in the period of unequaled population growth. Arnold became the site of bedroom communities for Baltimore and Washington. Because Arnold has no focal point, as well as its rural neighborly heritage, it has become very community oriented. Each community usually has a community association which plans activities around home and children. Names of the approximately thirty organized communities should indicate the “close to nature” feeling of the area. Those names like Bay Hills, Campus Green, Dividing Creek, Hunters Point, Moorings on the Magothy, Severnview, Shore Acres, Terrace Gardens, Twin Harbors express a certain feel for the land. Arnold is home to Anne Arundel Community College. The college started with night classes enrolling 270 students at Severna Park High School in 1961. In 1967 the school moved to its 165 acre campus off College Parkway in Arnold. The school was awarded full accreditation in 1968. The campus now includes 230 acres with a current enrollment of 14,699 students. Increasing from a one-room school at the corner of Baltimore and Annapolis Boulevard and Church Road in 1878, Arnold now has five elementary schools. There are also a middle school, a junior high school, and a senior high school. In addition, there are private pre-schools, elementary schools, and academies. As a result of the 1952 zoning changes, the Arnold Road intersection now has 2 filling stations, a Safeway Store, 4 banks, a furniture store, and the Arnold Station shopping center, complete with a MacDonald’s . Bay Hills Shopping Center and Cape St. Claire Shopping Center also supply Arnold with goods and services. Other individual businesses such as Special Beginnings Birth and Women’s Center and the YWCA have established themselves on Baltimore and Annapolis Boulevard. Providence Center, Inc. has two locations in Arnold. One of the newest businesses is Neil McGarvey’s Arnold Professional Pharmacy. Formerly at the Safeway pharmacy, Neil wanted to serve the customers better and be more personally helpful, so he opened his own business in Arnold Station shopping center. According to the census bureau, Arnold has a total area of 13.4 square miles, of which 10.8 square miles of it is land and 2.6 square miles of it is water. The 2000 census reports 23,422 people living in Arnold. Combined with Cape St. Claire’s 7,878 year-round residents, the Arnold portion of Broadneck supports 31,300 people. Twenty three churches are listed in the phone book. At least 45 doctors practice in Arnold. There are 12 marinas in Arnold. Broadneck Park is free and open to the public. Almost every organized community has a playground and/or community pool. The Baltimore Annapolis Trail connects Arnold with Annapolis and Severna Park. Along with the improvements that growth has brought to Arnold, there is a downside. Miles of traffic back-ups on Ritchie Highway, Route 50 leading to and from the Bay Bridge, and the Severn River bridge create frayed tempers and late appointments. Schools are overcrowded and in need of repair, and uncontrolled storm water runoff is polluting our rivers. Once again, controlling growth is a prime consideration of the residents of Arnold. Community associations have banded together in such groups as Arnold Preservation Council, Growth Action Network, Magothy River Association, and Broadneck Federation of Community Associations to be watch dogs for the area. The groups monitor traffic, land use and development issues, encourage active stewardship of the Magothy and Severn Rivers, and support local small businesses. Has Arnold come of age? Will I be strong? Will I be mighty man? Climb mountains if I can? When I come of age. What can we accomplish now? No longer need for ox or plow. enjoy the pleasures work has brought.